We open in Death Valley, California in a government facility. A mysterious person, who we don't see, walks through the various levels of the facility, unable to be stopped by the guards, as he tells them to shoot one another instead of him. When he reaches his destination, he free's a number of Super Powered beings, who quickly make short work of the rest of the guards coming to prevent the breakout. 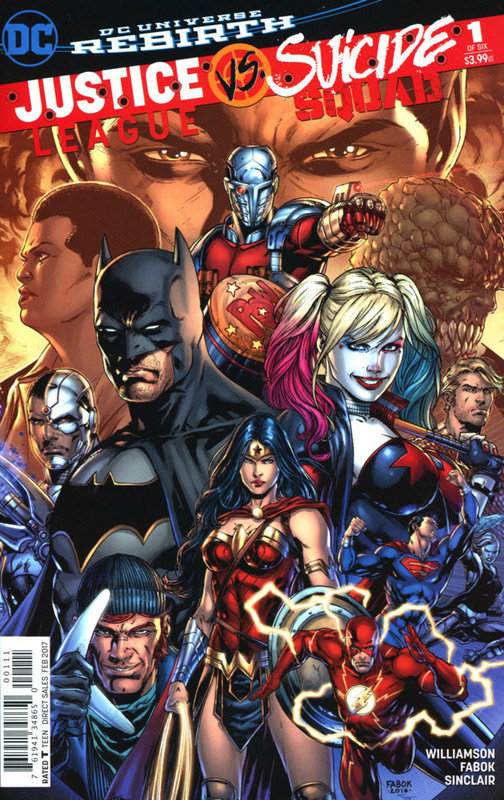 Elsewhere in Badhnisia, the Suicide Squad are on a mission, given to them by Amanda Waller who watches them from her home base at Belle Reve penitentiary. Meanwhile at the Justice League headquarters in space, Batman informs the League on the existence of the Suicide Squad, and how it is run by Amanda Waller. They decide that they need to put a stop to her so called Task Force X. In Badhnisia the Squads mission is completed, as Deadshot make the killing shot on the target. However, this leaves him in a compromised spot, as he falls to his death from a crumbling building. Superman manages to save Deadshot from falling to his death, and the Squad comes face to face with the League for the very first time. Amanda Waller commands the Squad to take out the League, otherwise she will detonate the bombs in the Squads heads. And the two teams engage in battle. Finally in the Swiss Alps, it is revealed that the mystery man who freed the Super Powered prisoners is non-other than Max Lord. And he freed the prisoners to form a team to help him save the world. The prisoners being Lobo, Emerald Empress, Dr Polaris, Rustam and Johnny Sorrow. Story - 5: It was rather generic, and some could argue almost clich� first issue. A mysterious player with a hidden agenda, the introduction of both protagonists (teams in this case) and the eventual face to face of said protagonists which leads into a conflict. This issue was a good start for this mini-series/event. Because in today's comic book reading market, the eventual trade paperback is what the writer writes for. We as an audience like to "binge" be it a TV series or movie series or even a book series. We like to get it all done in together as soon as possible. With that in mind we need to take into consideration, and look at this as an opening chapter in a graphic novel. There is a larger story to come, and we're just getting started. With that said and done, I guess the next argument would be that DC is cashing in the success of their cinematic universe and taking advantage of their up and coming properties with Wonder Woman and Justice League. And why wouldn't they? Marvel shamelessly has done it for a number of years, and with the popularity of certain characters such as Harley Quinn and the cash cow that is Batman, it seems like a logical step. 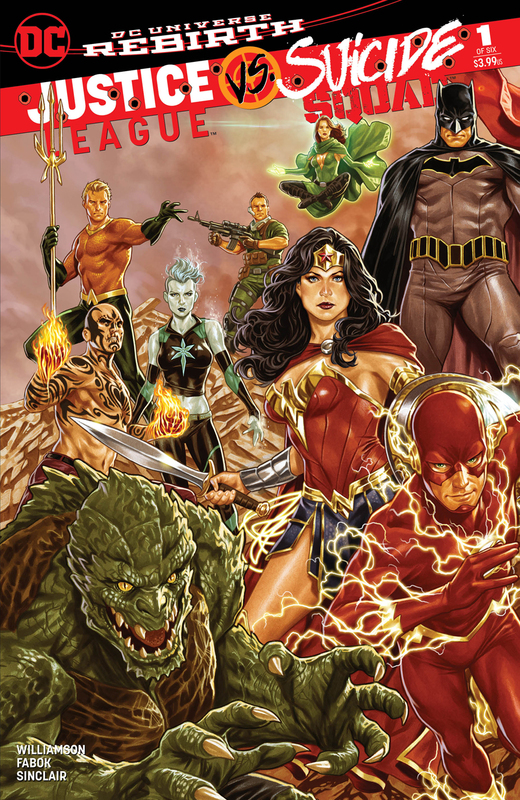 What I mean to say, that when Justice League hits theaters later this year, this trade will sell like hot cakes to the children, general audience, casual fans and I'm sure to some die hard Marvel zombies also. Now was the best time for this to come out, and I think it's rather smart of DC to have such foresight. So now that we have looked and explored the reasons to why this exists, let's actually take a look at what we actually got this issue. 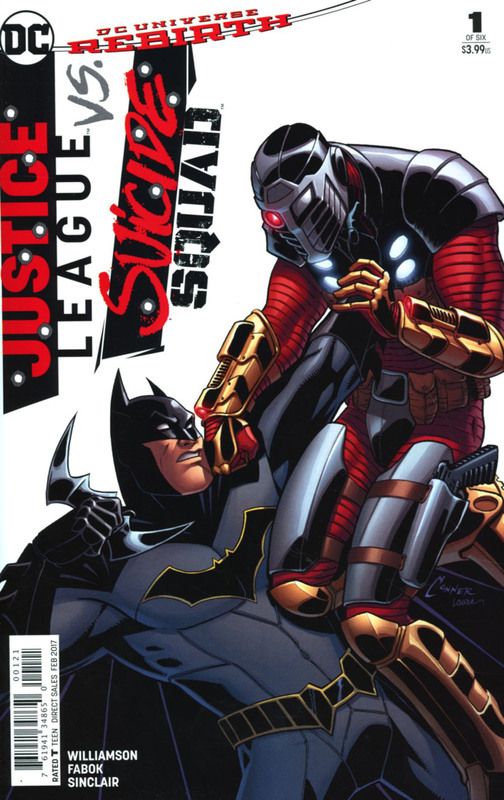 Number one, it tied into current DC Rebirth continuity, by elements of this book beginning not just in the SS regular series but also in Batman #13, in which Amanda Waller walks into the Batcave and takes files from the Bat-computer, whilst Batman is on the island of Santa Prisca, leading a Suicide Squad of his own, to rescue and recapture the Psycho Pirate from Bane's clutches. Number two, the implications of this series will no doubt have an impact on both teams once it's over, as well as the greater DCU in general. I don't want to give anything away to anyone that may not know, but a certain member of the Squad may end up on the side of the angels, in a brand new team. Why should we care?... Well, its character evolution for one. Why wouldn't a bad guy actually try and be good for a change? DC has "humanized" a lot of their villains over the past decade and a half. So I'm sure they one or more would prefer to stay out of jail, and be a hero for a change. Number three, I know a lot of fans complain about it, but I like seeing teams and characters fight each other in a big event once in a while. The SS are morally ambiguous at best, and their purpose is black op missions for the government. So it's interesting to see them go up against the premiere super team. I think there are a lot of good plot points that can be explored. And if written well, it could be something that will be looked back at with fondness from the readership as well as have any form of adaptions in to other media. My favorite part is the anticipation of how this tale will unfold, and what surprises the creative team may have up their sleeves for the coming issues... This directly leads me into the negatives parts of this book. The major part being, that a lot of this was spoiled in the preview/promo they put in almost all the books in the Rebirth line. So we already knew about Max Lord, Lobo, Emerald Empress, Dr Polaris, Rustam and Johnny Sorrow being key players in the series in some way. As well as the aforementioned character that supposedly switches side. But as I said, I liked how this book started, and really am looking forward to seeing where it eventually leads. I like Lobo very much... So I want to see him throw down with our boy Big Blue. Lastly let me touch on the Superman moments. I found it odd that Superman didn't already know or tell Batman that he knew about the SS seeing as he's from the Pre-New 52 continuity, where he has had at least two confrontations with them, that I know about. Another small nit-pick is that every character in the JL scene got Dialogue box introductions, except Superman. Maybe editorial missed that one. I did however like Superman's rescue of Deadshot. It was such a classic moment, one that you can't just pass up. Superman saves people, it's what he does! Art - 5: I have always loved Jason Fabok's art, and here he takes on both pencilling and inking duties, to which the art doesn't suffer at all. There are only a few comic artists that can ink themselves and do an excellent job. George Perez is at the top, followed by Brian Bolland. I'm happy to add Fabok's name to that list. The splash page featuring the Squads first appearance this issue is poster level great. The panel work throughout the book is also to be commended. The story has a great flow throughout this issue, and can be understood without eve reading the word balloons and dialogue boxes. Superman saving Deadshot was an excellent page. I love how graceful and relaxed Superman looks as he catches Deadshot, and the shock of being saved in Deadshot's body language. The Justice League "hero" shot, after Superman makes the save is another awesome page. Fabok really has a feel for strong splash pages. The two page "battle" splash is simply awesome, it's just a shame that it was used heavily in the promo pages leading up to this event. 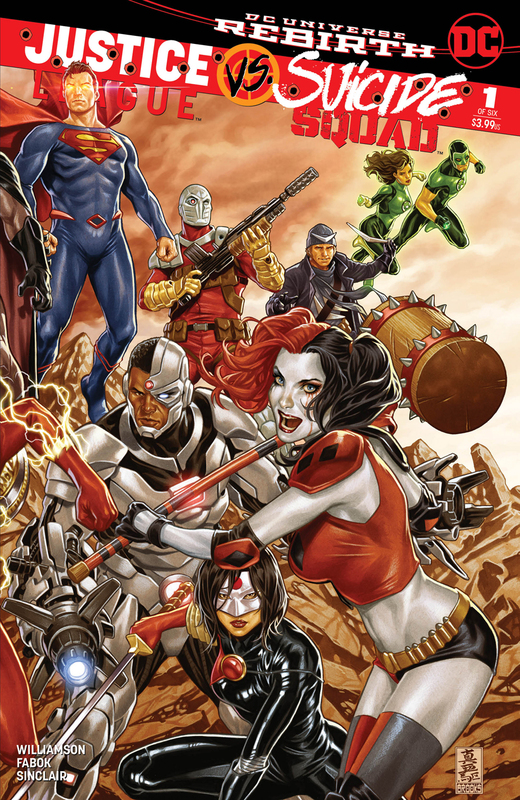 The only downside to the art I didn't enjoy as much was Deadshot's costume. I much prefer that one Jim Lee had introduced in the later issues of the SS book. Reminiscent to the movie costume worn by Will Smith. Also the pointed Batman style blue boots that are on Superman's suit. But that's not really Fabok's fault... We can thank Keith Giffen for that look. I can't leave without mentioning the great job that Alex Sinclair did with the colors. He's still one of the best in the industry! Cover Art - 5: This is pretty much a generic cover, but it does its job really well. All the key players are front and centre, and gives you a feel for the series. I like Max Lord's eyes in the back. Most certainly will be used as the cover to the trade. Great job by Jason Fabok. Though Superman could have had a larger presence on the cover... And Why is he fighting Killer Frost?... Something to come perhaps? Variant Cover Art - 3: Batman vs Deadshot. I feel that they milking the Batman/Deadshot encounter from the SS movie. A very cartoony looking cover, but it's not too bad. Variant Cover Art - 4: Batman vs Deadshot... Again... I like this a little more because it's Gary Frank doing the art. Though I never really liked the way he drew Batman's cowl. Variant Cover Art - 4: Wonder Woman vs Harley Quinn. A bit of a cash in on the popularity of both characters, but they're meant to fight each other, so why not? Lee Bermajo is one of the regular cover artists on the main SS series, so good to see that he provided one for this series. Variant Cover Art - 1: Wonder Woman vs Harley Quinn... Again... This time all they did was make the previous cover grey scale. I'm sorry DC, this was not necessary. Lowest grade I've ever given a cover.